That's why corporations fear a breach reporting reputation system. That's also why we need one. Or is it really phishing when the victim first broadcasts his bank account details? BTop Gear presenter Jeremy Clarkson has admitted he was wrong to brand the scandal of lost CDs containing the personal data of millions of Britons a "storm in a teacup" after falling victim to an internet scam. The outspoken star printed his bank details in a newspaper to try and make the point that his money would be safe and that the spectre of identity theft was a sham. He also gave instructions on how to find his address on the electoral roll and details about the car he drives. 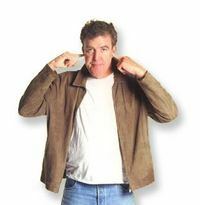 However, in a rare moment of humility Clarkson has now revealed the stunt backfired and his details were used to set up a £500 direct debit payable from his account to the British Diabetic Association. The charity is one of many organisations that do not need a signature to set up a direct debit. "The bank cannot find out who did this because of the Data Protection Act and they cannot stop it from happening again," he said. "I was wrong and I have been punished for my mistake." At least he doesn't call for revoking that Act; he does call for going after the perpetrators. The Government will face fresh questions over the loss of millions of voters' personal data amid evidence the debacle has helped fuel a massive slump in public confidence. One poll showed those backing Labour's ability to handle economic problems had been more than halved to 28%, with just a quarter deeming Gordon Brown's administration "competent and capable". And another gave the Tories a nine-point overall lead, its strongest position for 15 years, just weeks after Labour enjoyed an 11-point advantage in the same poll. A government in risk of falling due to lack of breach security and perceived lack of technical confidence might be what it takes to get governments and industry to take breach security seriously. For example by requiring breach reporting. This paper studies an active underground economy which specializes in the commoditization of activities such as credit card fraud, identity theft, spamming, phishing, online credential theft, and the sale of compromised hosts. Using a seven month trace of logs collected from an active underground market operating on public Internet chat networks, we measure how the shift from "hacking for fun" to "hacking for profit" has given birth to a societal substrate mature enough to steal wealth into the millions of dollars in less than one year. — An Inquiry into the Nature and Causes of the Wealth of Internet Miscreants Jason Franklin, Vern Paxson, Adrian Perrig, and Stefan Savage. Proc. ACM CCS, October 2007. How to stop it? Law enforcement is good, but insufficient. Ditto traditional technological Internet security methods. We already knew that. What now? Real progress will be made by disrupting the criminal economy by poisoning trust. Read the paper for the authors' suggestions of Sybil attacks and slander attacks. Make the criminals' identities unreliable and poison their reputations. This is considered the paper of the year by some prominent computer security professionals, and for good reason. The APWG eCrime Researchers Summit has released its papers by linking them to its agenda. Lots of interesting stuff there about phishing and website takedown, capture and recapture, password reuse, behavorial reaction, etc. There were also sessions on getting technology solutions adopted and user education, but those appeared to be panels, and don't have papers posted. The Anti-Phishing Working Group is having one of its periodic member meetings, this time in Pittsburgh. Probably I shouldn't report too much detail, but I'll say that interesting things are going on worldwide that may spread to other countries. For example, in Japan it seems that fake programming sites are more popular than phishing. Also, if I heard correctly, most phishing in the Japanese language originates from phishers in Japan. This would make sense, since it's very hard for foreigners to write well enough to pretend to be Japanese. So that one probably won't spread too widely, but the fake programming scam could. My favorite is the history attack. World War II ended on 15 August 1945 in Japan, so a timeline of that war can get a lot of hits on a war's end link in August of any year. Who would have known history could be so popular? Meanwhile, during Carnival in Brazil, nobody reports malware, so there's a dip in measurements.... Then and the rest of the year, sophisticated personalized social engineering attacks seem to be popular in Brazil. Iang reminds me that it was on his blog, Financial Cryptography, that I saw the rough estimate of how much an identity theft costs, that is, about $1,000. He follows up on my post of yesterday about LifeLock, discussing a company called Integrity which insures identities in Second Life. Or, actually, insures any lawsuits resulting from "inappropriate content", whatever that is. How viable is this model? The first thing would be to ask: can't we fix the underlying problem? For identity theft, apparently not, Americans want their identity system because it gives them their credit system, and there aren't too many Americans out there that would give up the right to drive their latest SUV out of the forecourt. On the other hand, a potential liability issue within a game would seem to be something that could be solved. After all, the game operator has all the control, and all the players are within their reach. Tonight's pop-quiz: Any suggestions on how to solve the potential for large/class-action suits circling around dodgy characters and identity? This wraps right around to the original reaction of the person from whom I heard it (hi, Anne Marie) on a list that is silent. By now you've heard the stories about Americans whose identities have been stolen. They're not pretty…people working for hundreds of hours over many years to get their lives back in order, kids not getting student loans because someone has already ruined their credit, people losing homes because thieves placed mortgages they never knew existed, even innocent individuals ending up in jail. LifeLock can keep this from happening to you and we guarantee our service up to $1,000,000. I seem to recall reading that the typical identity theft is only worth $1,000, but nevermind that. You've heard Rush Limbaugh, Paul Harvey, Dr. Laura, Sean Hannity, Howard Stern, Dr. Joy and others endorse us. Well! None of those people would ever sell pure fear, would they? If your Identity is stolen while you are our client, we’re going to do whatever it takes to recover your good name. If you need lawyers, we’re going to hire the best we can find. If you need investigators, accountants, case managers, whatever, they’re yours. If you lose money as a result of the theft, we’re going to give it back to you. For $110/year or $10/month, is such an insurance policy overpriced, underpriced, or what? Are You Ready for Some Football Storm? What do you do with the world's fastest supercomputer? Use it to follow football, of course! Today we started seeing new Storm mails and the web pages changed layouts completely. Now the theme is National Football League (NFL) which is timely considering the 2007 NFL season started on the 6th of September. 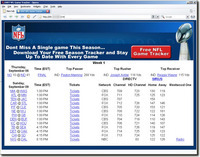 The website even has the correct score, statistics, and schedule information. It's sort of like gambling on the game; gambling that some suckers will think the site is legit. PS: Seen on Fergie's Tech Blog. Is it phishing if an ISP does it? We do apologize but we are unable to locate your account with the information provided. To answer your question more precisely please reply to this e-mail with your account/wireless number, date of birth and full billing address including the postal code. Please note if there is a password on your account you will need to provide it or we will not be able to access your account. Once we are able to locate and access your account and provide you with the information requested. We will reply within 24 hours. Even if it's not, it's just asking for somebody to intercept it.